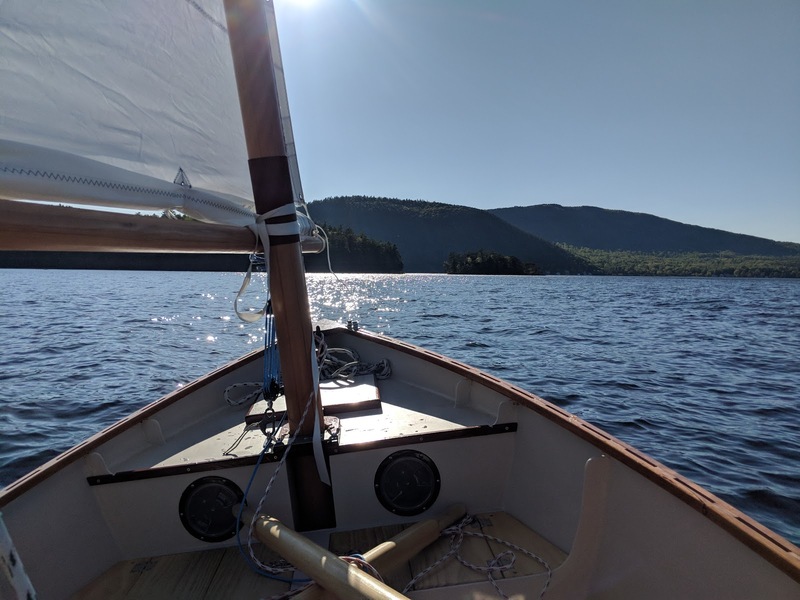 Last week I had my 25th sail on the boat and I'm really feeling comfortable in almost every condition. 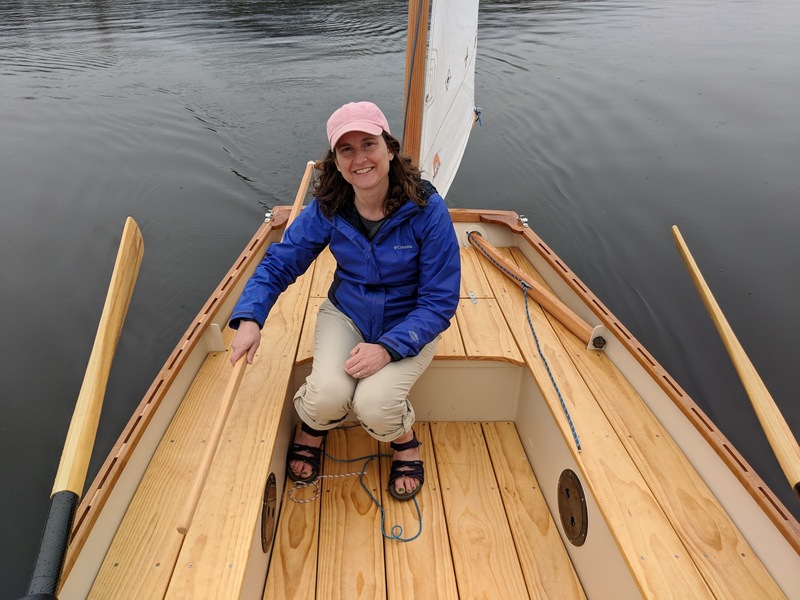 I've had light days with more rowing than sailing as well as some really windy, gusty days where I don't have a free hand to even get a drink of water. 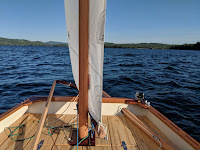 At this point I have the launch procedure fully dialed and it only takes me about 10 minutes from getting to the launch to sailing or rowing away from the dock. The thing that slows me down the most is people asking questions about the boat and commenting on how pretty it is out on the water. As far as performance goes, it just keeps getting better as I learn the lug rig. I regularly hit 8-9 knots on the GPS once the boat gets up on a plane and had one 10.3 kts registered on the GPS on a windy quarter reach. It is no slouch on any tack and while it won't quite point as high as a bermuda rig, it's close. 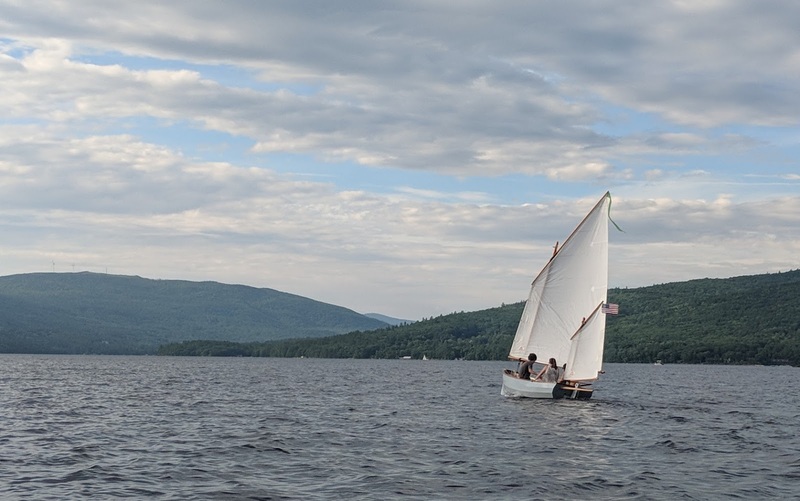 On a broad or quarter reach I regularly sail past performance dinghies. Over time, I've changed very few things regarding rigging, but have made a few improvements. Most of the items have been rigging performance related including adding dog collars to the main and mizzen booms to keep them close to the mast. 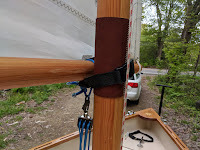 The one big thing I still need to do is to replace the halyards with lower stretch Dynema core because over the course of a day out on the water, I have to keep vanging the main down to keep the sail shape taught because the current halyard stretches too much. The only reason I haven't done it yet is because with a son off to college this fall, I don't want to spend the money. I will swap out the halyard this winter. 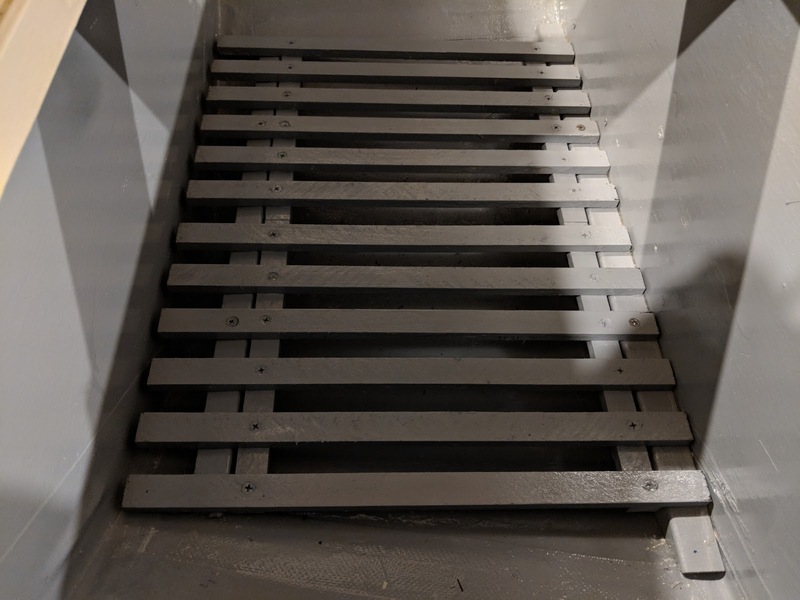 The only boat modifications so far are building a removable grate in the 'cooler' just aft of the mast so bilge water doesn't get everything too wet and a storage solution for the 2 piece oars that until just last week have been rolling around in the bottom of the boat. This winter I have plans for building a tent over the boat for sleeping, but I have yet to do an overnight (that's on my list for this summer though). I've been out for five sails since launch and each time I learn something new. Two of the days were really light (< 5 kts), one was just about perfect for my first day out solo (5 - 8 kts), and 2 were downright windy. I always seem to learn more about what doesn't work on the windy days, but fortunately nothing completely failed although the conditions (gusts verified to 25 at lake weather station) highlighted a bunch of rig tweaking needed to optimize performance. 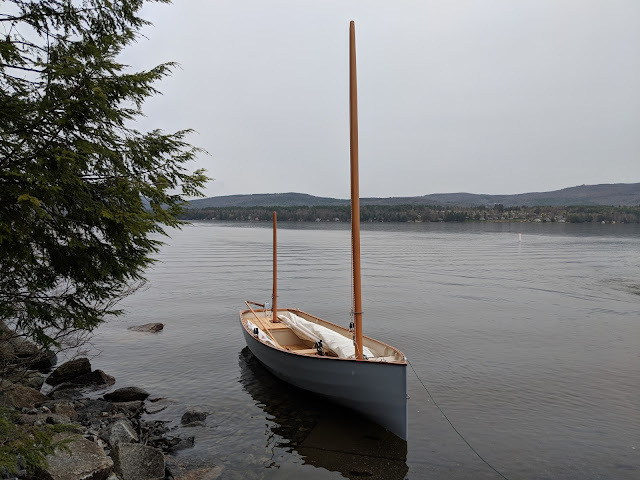 Most of the tuning is minor, but the mizzen will need to be raised about 2 inches higher in order to clear the swing arm of the Norwegian tiller because it is offset from horizontal to clear the stern. It only happens when on a reaching run on the starboard side, but it is a bit annoying. Right now I think I am going to solve it by adding a small block on the bottom of the step, but I haven't entirely decided yet. 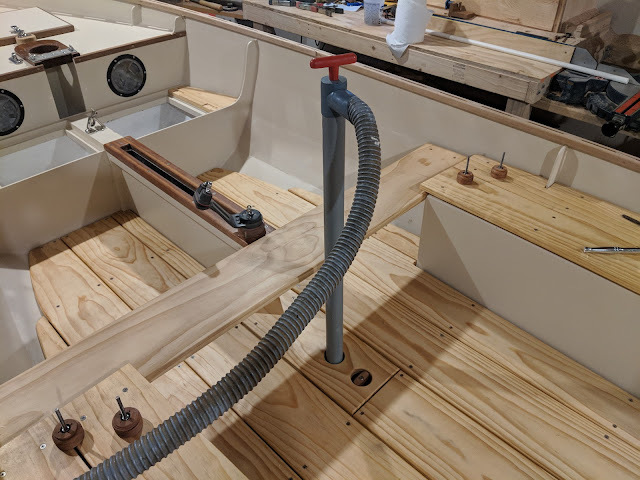 Other things that I've been tweaking are the yard attachment point for both the main and mizzen. When I originally set them, the sails didn't quite hang right so with some with some online advice I move the point a little bit forward. I also had to restitch the location of the yard leather as a result. Keeping the boom close to the mast even with my 6:1 downhaul has been a challenge and on the last windy day sail, I tied the boom around the mast with a sail tie. Looking online though I found that a lot of people are using dog collars with a big snap clasp so I went to the pet store yesterday and bought a couple and fitted them to the rig. It seems like this will be a good solution, but I haven't tried it on the water yet. So now for the good news: this boat just flies. It happily gets up on a plane and even though I have been being pretty timid so far about pushing her, I have gone over 7 knots several times on the windy days with much of the time spent in the high 6's even with some lumpy conditions. The water on the lakes here is still dangerously cold however, so I don't want to push it too much and end up in the water. Capsize tests will hopefully be held once the water is more comfortable. 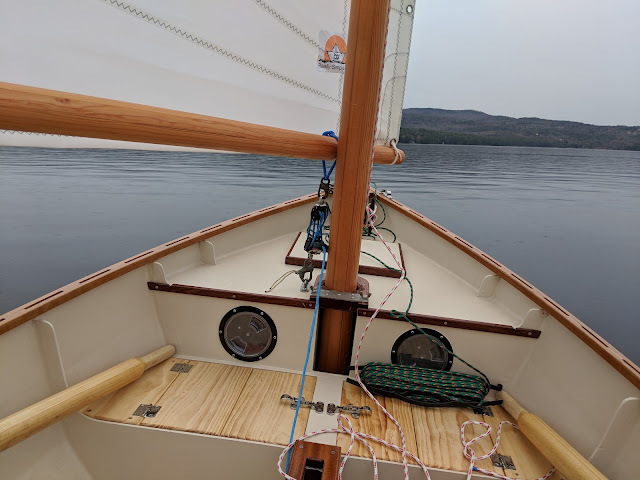 I'm really looking forward to getting the boat out on the ocean with a nice steady sea breeze to see how fast I can get her going, the gusty, squirrely conditions on the local lakes are really challenging and make me think twice about really hiking out because you never know when the wind will hit you from the other side of the sail and throw you in the water. It happened, it didn't sink, and I'm happy to report that there was no drama at all even though I was pretty nervous thinking about all that could have gone wrong. The launch actually took place over two days, mainly because it was really gusty on Saturday and I really didn't want the first sail to be in sketchy conditions, but I really wanted to get it in the water. 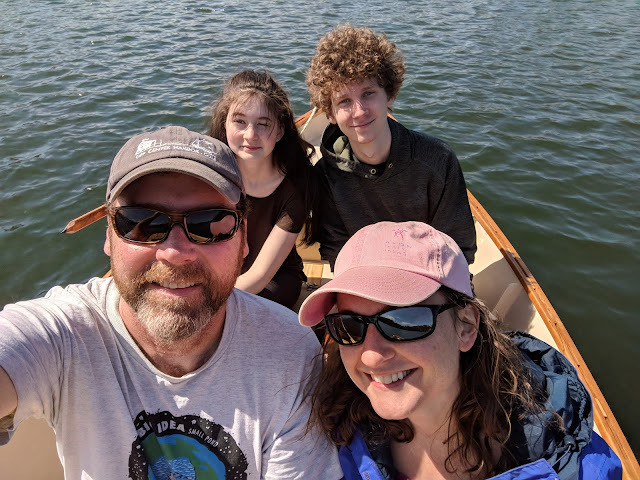 So we did a quick run over to a small pond close to us just to splash it and row around a bit and to see how the boat felt being towed on a trailer. My first impressions were that it rows way faster than the O'Day Daysailer that I have been rowing for years and that it was actually more stable that I expected. With all four us onboard, it never felt tippy. After we came back from the row, I built spar crutches for the main an mizzen steps and mounted the main mast on it. Everything else tucked into the cockpit easily so there isn't a lot of rigging to do to get ready to travel. I re-rigged the entire boat to make sure I had everything in order and then stowed it all away again to be ready for the next day. Today I woke to cloudy skies and rain showers with not much wind. I could have done without the rain, but temps were in the high 50's and I definitely wanted low wind conditions for the first day out. So with just my wife and I today (kids were working), we drove up and launched at Newfound Lake. Newfound is one of my favorite lakes in New Hampshire. It's big and deep with crystal clear water and a great launch. Since it wasn't a very nice day and it's only been about 2 weeks since ice-out (read: very cold water), the only other boaters there were salmon fisherman and most were headed home by the time we got there. 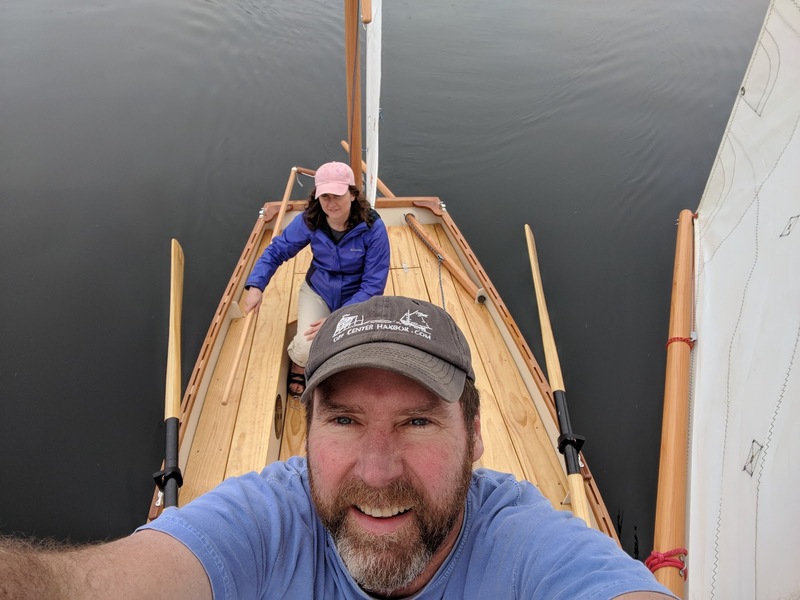 We launched with little fanfare and shoved off under oars. Once we were out a hundred yards or so, I raised the mizzen followed by the main and headed out. The wind was super light, but we ghosted along and crossed the lake in short order. A little rain here and there, but nothing that got us too wet. All in all things turned out great, the biggest issue of the day was that I forgot my rigging knife, raincoat, and the battens for the main, but not too bad in general. 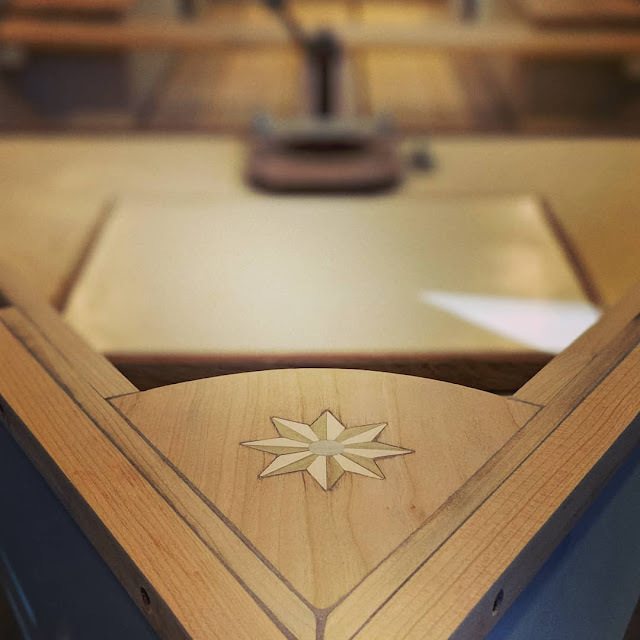 I still have a bunch of other posts to do to cover topics I never got to like oars and the daggerboard, but those will wait so I can bask in the launch. 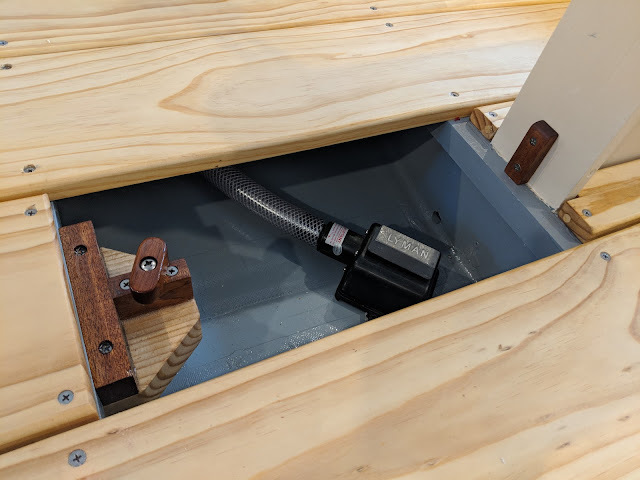 You may recall that I installed a bulkhead mounted bilge pump back in October (here), but with the floorboards covering the intake strum box, I was a little worried that if it were to become clogged I wouldn't be able to access the strum box easily to clear it. 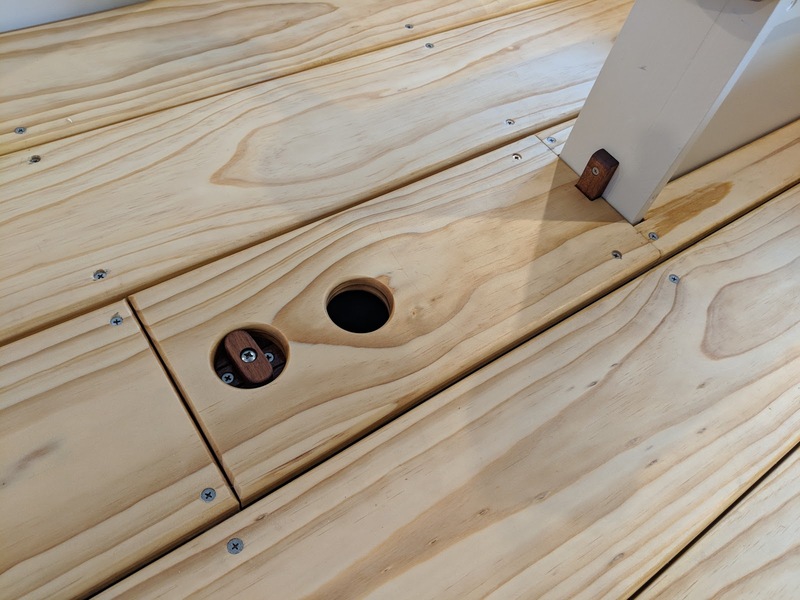 While most of the floorboards are screwed to frames and have to be removed with a screwdriver, I wanted the center floorboard to be removable in a quick fashion. I researched a lot of different designs/ideas and found that most of them that included specialty fasteners that were quite pricey and required a high degree of precision to be effective. Those that didn't, seemed to be flimsy at best and seemed generally unstable underfoot. 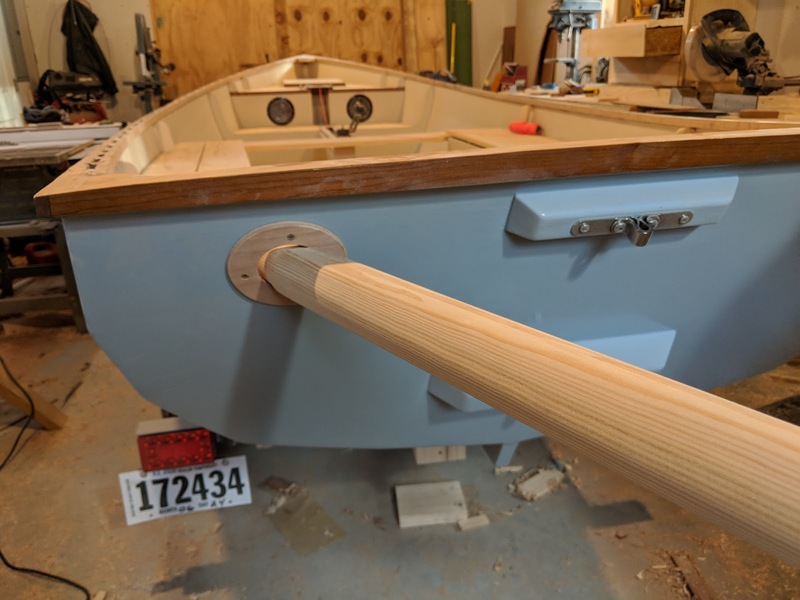 Fortunately, searching the woodenboat forum led me to a design that was both inexpensive and seemed like a good fit for the boat (Woodenboat Forum Floorboard Post). 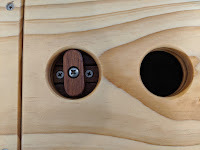 The design uses a wooden toggle to 'clamp' the floorboard in place making it secure and strong. 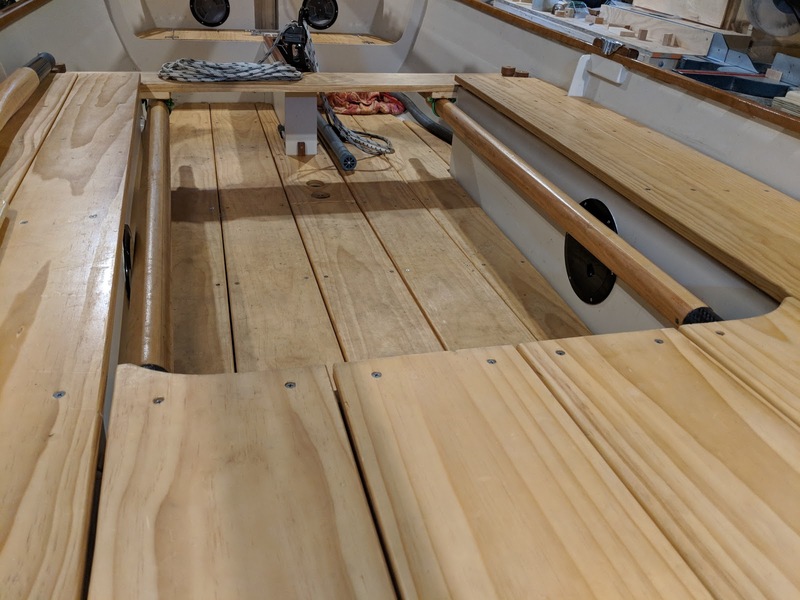 I decided that the best approach would be to cut the floorboard so that the removable section would only span the area between two frames, directly above the location of the bilge pump strum box. 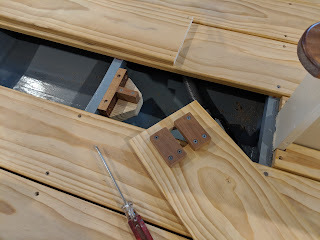 Of course this could come back to bite me if the limber holes get clogged up over time and will require that I remove the section that is screwed down to clear those, but I think that could be limited to a yearly maintenance sort of thing. 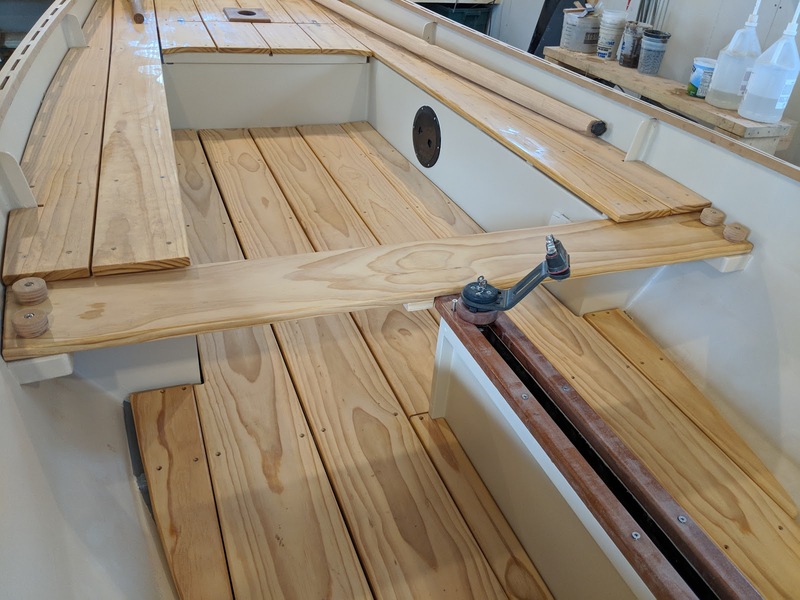 I started by building an assembly that would screw to the frame and be held above the bottom of the bilge but would support the cut floorboard and serve as an alignment clamp for the toggle. I tapped a 1/4" hole in the center of the assembly to install a 3" bolt to serve as an axle for the toggle. For the toggle, I found a scrap of mahogany and shaped it down to a 'bean' shaped toggle about 1-7/8" long and 5/8" wide. 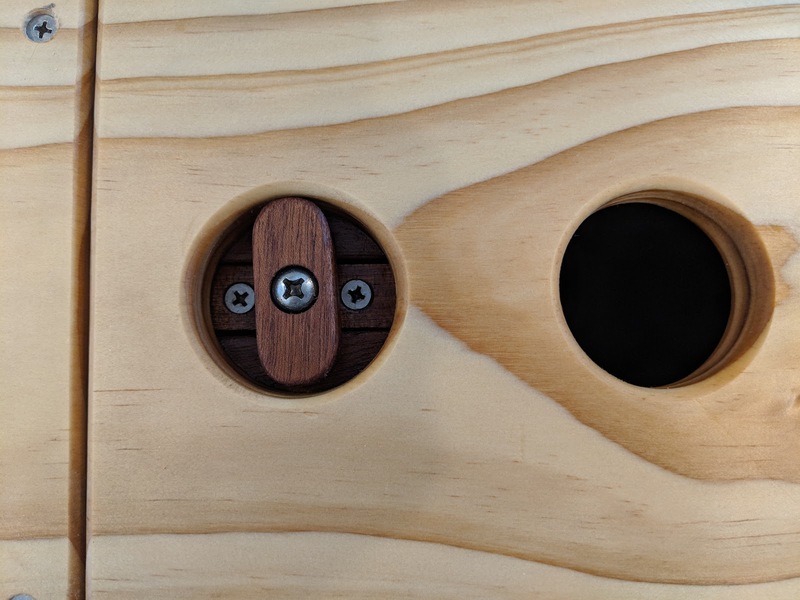 Next, I cut out a 2" hole in the small section of floorboard and screwed and glued two mahogany cleats to either side of the hole. The spacing of these cleats was just a hair bigger than the width of the assembly screwed to the frame. I coated both the cleats and assembly in unthickened epoxy and left it overnight to cure before installing the toggle and axle bolt. 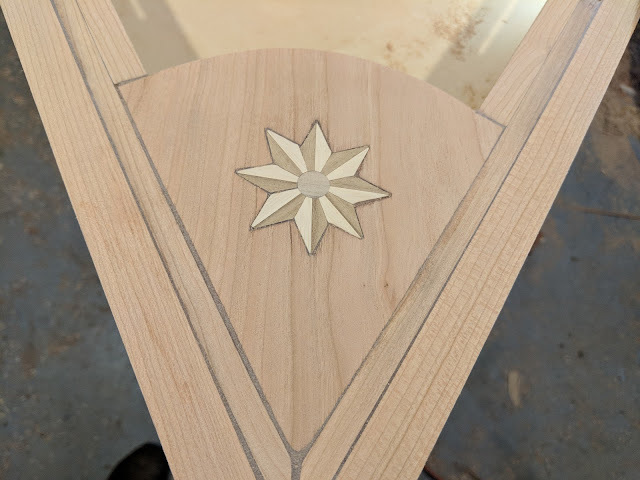 Moving on, I cut out a second 2" hole with the holesaw and rounded over both holes to smooth out the appearance with my router. 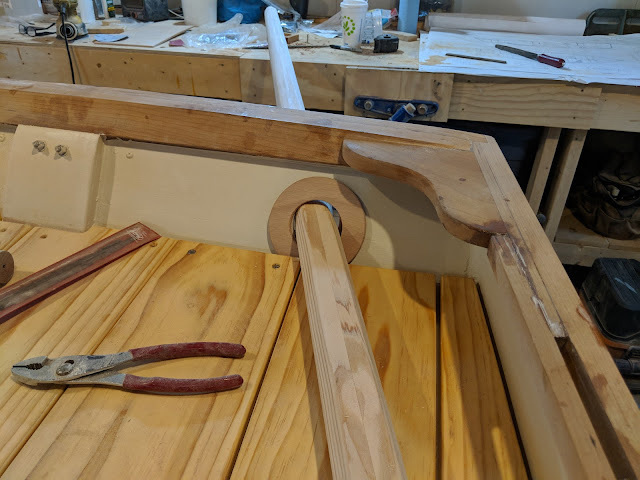 The second hole will serve as a 'handle' to pull the floorboard, but I made it 2" so that I can fit an auxiliary pump into the hole if the other pump fails. Of course, there will be a bailing bucket on hand for 'special occasions' if/when the boat is swamped. There have been a ton of little things happening in the shop over the past month. Individually, they were each pretty small and didn't warrant their own post, but together, I've wrapped up most of the odds and ends needed to get the boat in the water. For starters, I devised a way to hold the center thwart securely in place but making it easily removable to open up the cockpit for sleeping. 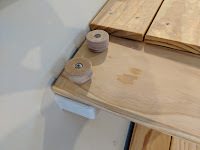 I installed 2 threaded inserts on each side of the boat on the base where the thwart sits. Then I turned some cherry knobs and drilled them out to accept 1/4" threaded stainless steel screws. 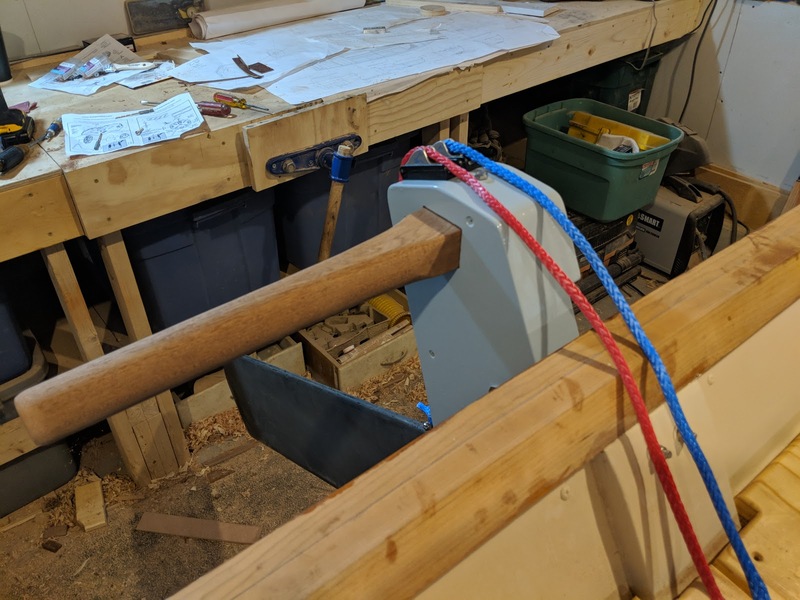 I tapped each side of the thwart for the screws and mounted a block that would allow the thwart to 'grab' the daggerboard trunk and help transfer the load while under sail. Next up, I finally came to terms with the fact that I really needed to install a bow eye for trailering at some point. 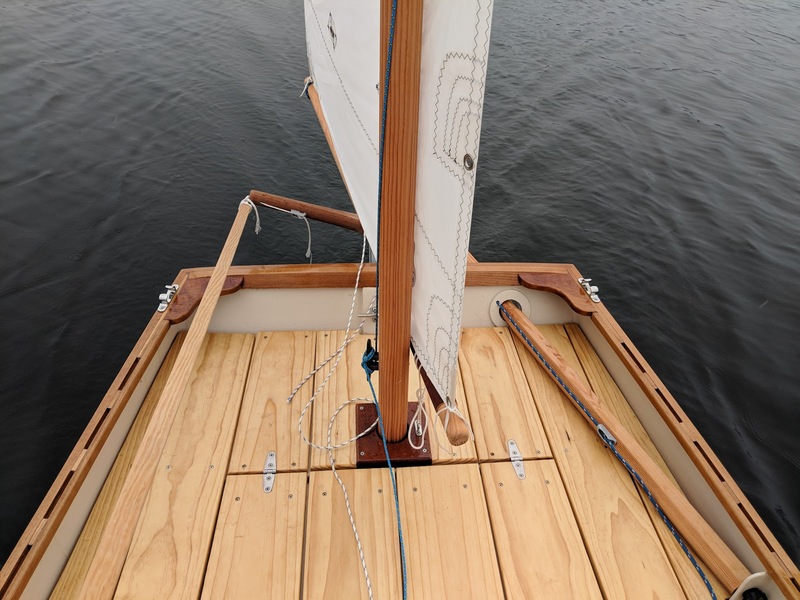 I didn't want to mainly because I don't like the look and the installation would be difficult because the bow is so narrow. 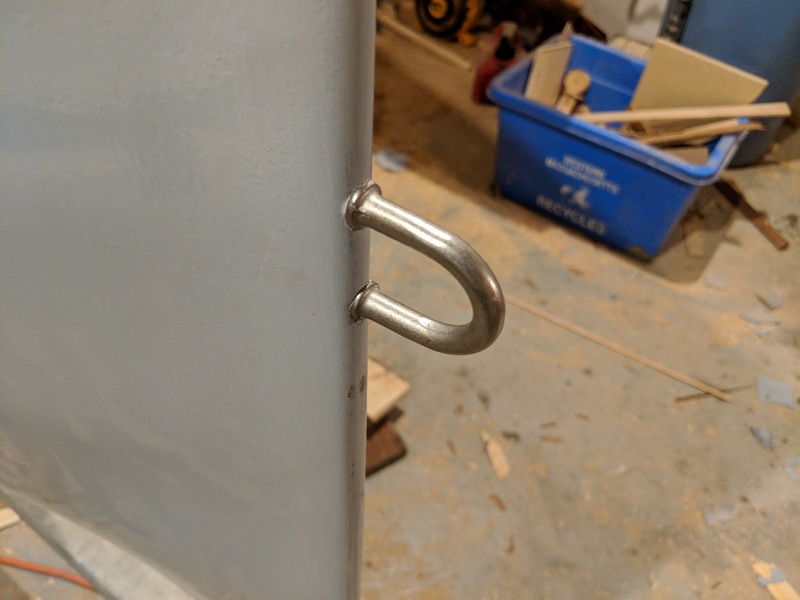 I found a nice stainless bow eye online (I don't remember where) that had 2 - 3" legs. I like the 2 legged bow eyes because the don't spin if the backing nut loosens up. 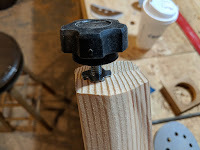 To install it I carefully measured and re-measured where to drill to make sure that I had the legs spaced properly and to ensure I could access them from the inside to get the nuts on. 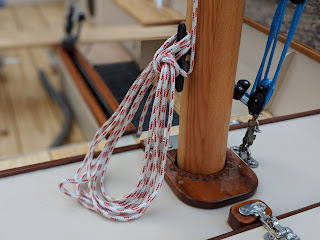 Moving aft, I finished rigging the boomkin with a small harken carbo block and a clam cleat to handle the mizzen sheet. I also drilled a small hole just above where the boomkin goes through the transom so that the sheet can pass through from the block to the clam cleat. I took a few photos but there isn't really much to see. I also finally finished up the rudder assembly and mounted two cl-257 auto release clam cleats to control the rudder's uphaul and downhaul. I used small padeyes screwed to the leading and trailing edges of the rudder to attach the uphaul and downhaul. There are a bunch more updates, but I'll split it up into a second part later this weekend. 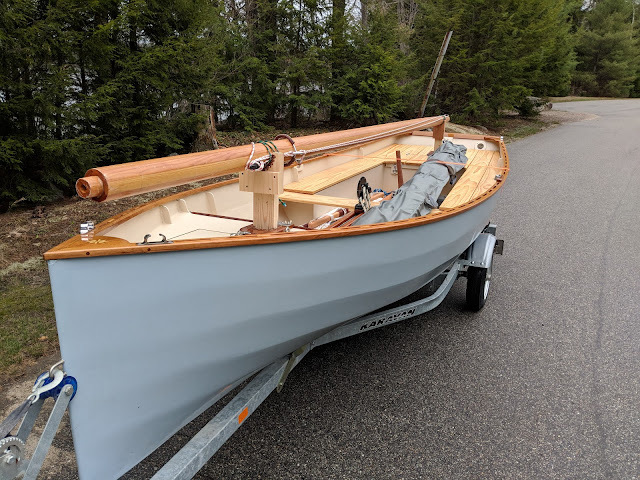 A few months back I built up the boomkin spar out of leftover douglas fir that I had from the other spars, but I didn't do a birdsmouth this time. Instead, I ripped four pieces to length about 25mm x 25mm and then cut off a corner of each and glued them up to make a 4 section hollow spar. Once it had cured, I knocked off the corners to make 8 sides and then rounded the end of it down while leaving the section that will be inside the boat with 8 sides. I liked building with the birdsmouth method but I just didn't want to take the time for the boomkin since I'm not as worried about weight (although it is still hollow to shave a few grams). Fast forward to last week and I decided it was time to cut the hole for the boomkin. 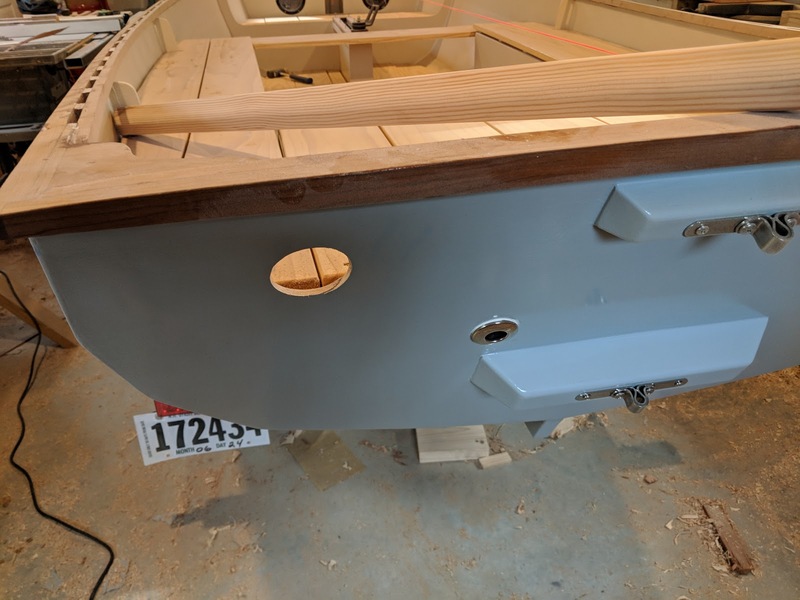 Cutting holes in boats always makes me a little squeamish, so I had to come to terms with it on my own time. 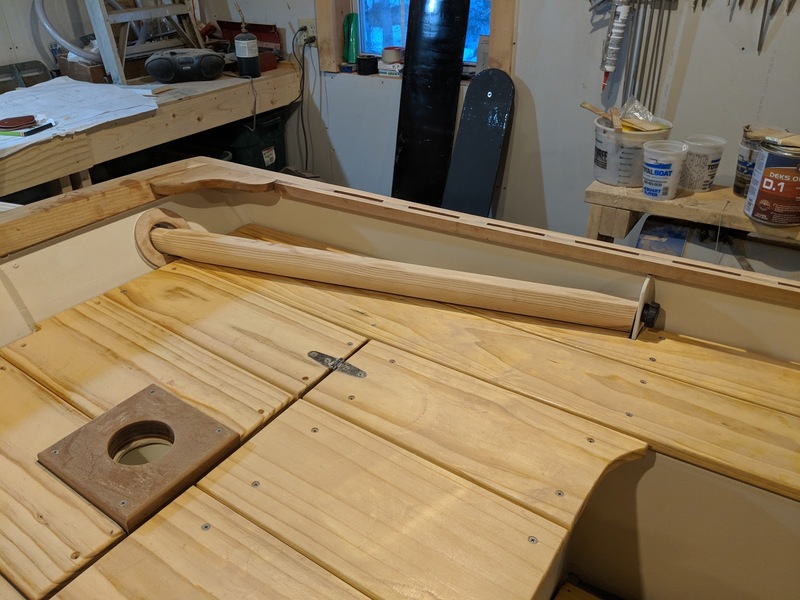 To find the location, I basically laid the finished boomkin on top of the stern and eyeballed where it would protrude to the centerline and cut out a 2 inch hole at an angle in the transom, just above the level of the deck. Next, I cut the same hole in a few pieces of 6mm ply and then rounded the pieces to make a 35mm flange surrounding the hole. Then I screwed and glued the pieces to the transom and faired it out with some thickened epoxy. A bit of cleanup with a rasp and sandpaper made it all look good. 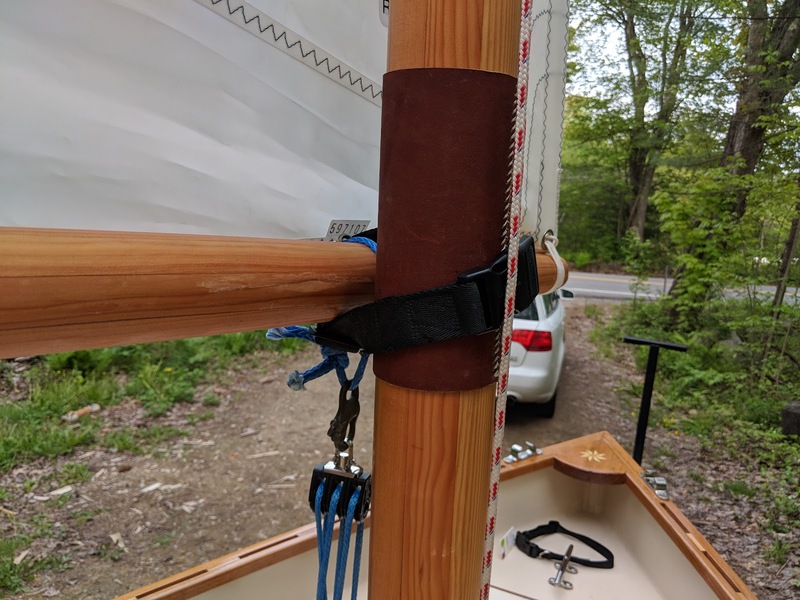 After a test fit, I tapped the inboard end of the boomkin and installed a 5/16" threaded insert and tapped a corresponding hole in one of the frames to anchor the boomkin. 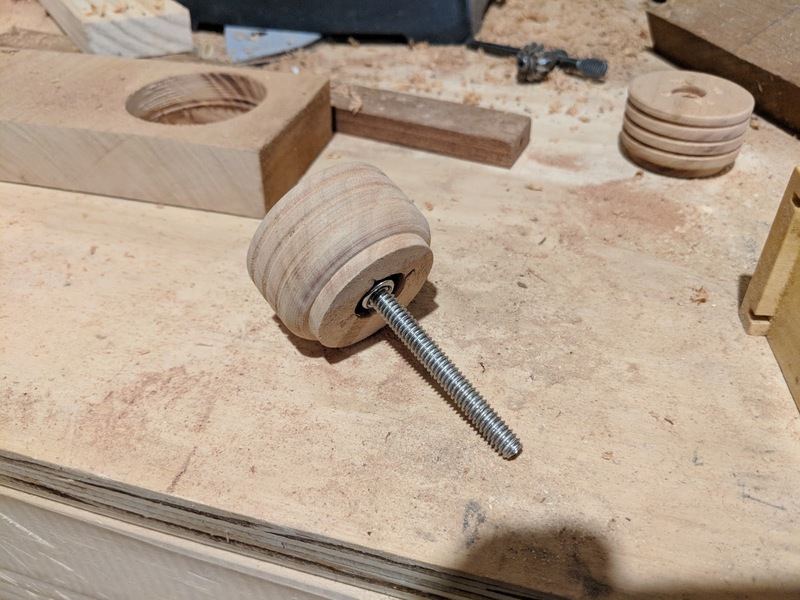 I found a 5/16" thumbwheel and screwed it in place. I still have to leather the boomkin where it intersects the hull and soak in some Deks to protect it, but aside from installing the mizzen sheet hardware (a turning block, and clam cleat), I'm checking it off my to-do list. Way back in 2015, I rebuilt the forehatch on my 1962 Alberg 35 and did a compass rose inlay on the inside of the hatch here. 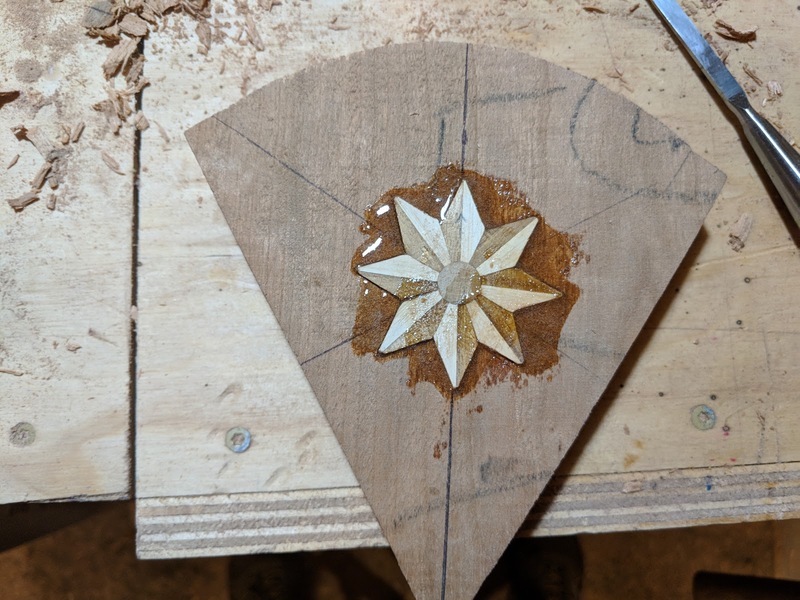 The way I made the inlay allowed me to slice off pieces like a loaf of bread and I had a number of compass roses that were just sitting around on my desk doing nothing. So when I got around to making the breasthook this past week I decided to put one of them to good use. 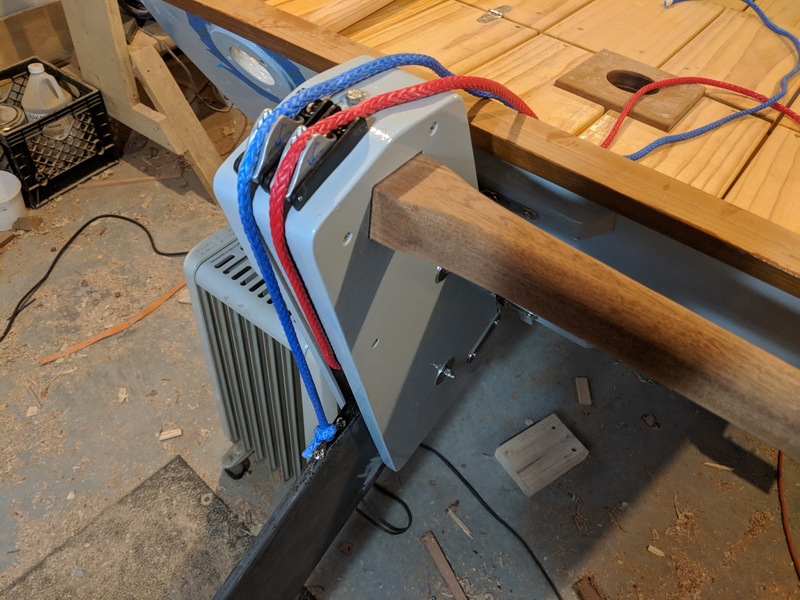 I began by finding a nice piece of cherry to match the rail (also cherry). The key to getting the fit right is to lay it on top of the V section of the bow and trace where it meets. Then I cut out the rough V shape and slowly cut the rail angle down with a shinto rasp so that it would slide into place. 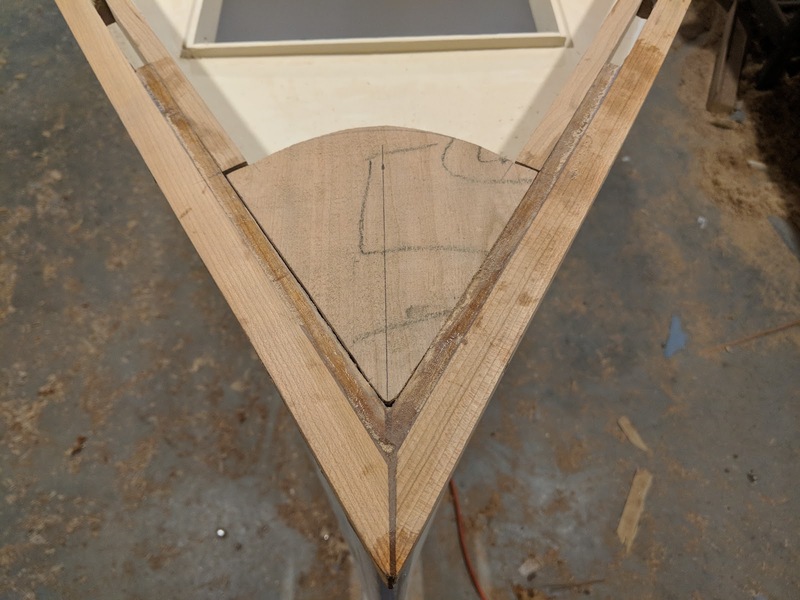 Most breasthooks have a concave curve facing forward, but I decided to go against the grain and reverse the curve and have it facing aft. 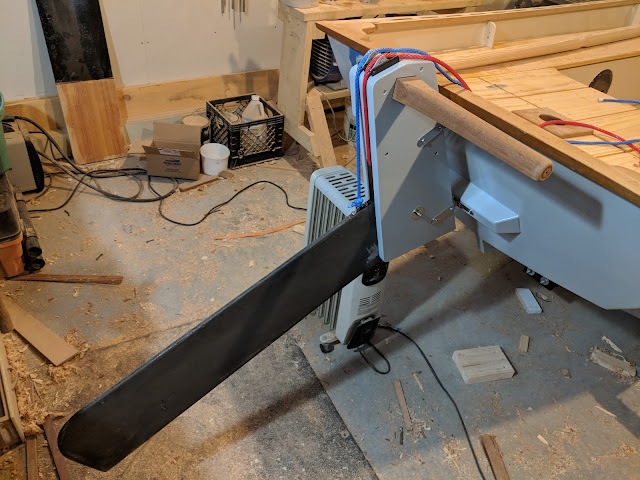 I did this partially because I wasn't really thinking, but I will mostly say that it was because I plan on mounting a cleat (or small sampson post) on the trailing edge of the breasthook and if the curve is concave it wouldn't work. 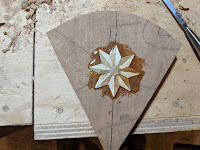 Once I had the breasthook fitted closely to the inner rail, I started on the inlay. 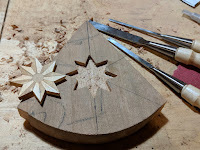 Having experimented with this sort of thing before I found that placing the inlay in the desired position and tracing the outline of it with an exacto knife works best for me. 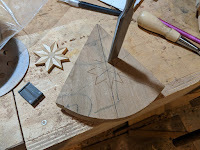 After I had etched the outline of the compass rose onto the breasthook, I took a really sharp chisel and hammered it along the lines to make sure the cherry was cut along outline. Then it was a matter of carefully chiseling out the interior of the cut lines and then repeating the outline chisel to go deeper. The compass rose was about 6mm deep total and ended up with the compass about 2 mm proud of the cherry. 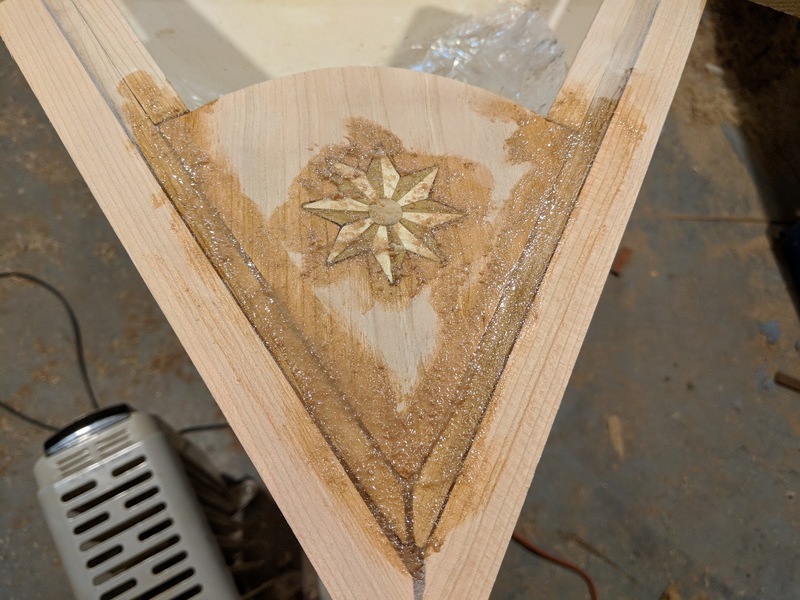 When I had it fitting well, I mixed up a batch of epoxy with fine cherry sawdust and glued the compass in. 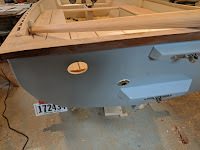 I let it cure and then sanded it all down before fitting and gluing the whole thing into the boat. Once again, I let it cure and then sanded everything down flush with 80 grit paper. I still need to radius the edges with a router to soften things up and of course lots of varnish, but I think it should work out well.